This article is about newspaper headlines. For other uses, see Headlines (disambiguation). For the Wikipedia guideline, see Wikipedia:Manual of Style (headings). The headline or heading is the text indicating the nature of the article below it. Headlines in English often use a set of grammatical rules known as headlinese, designed to meet stringent space requirements by, for example, leaving out forms of the verb "to be" and choosing short verbs like "eye" over longer synonyms like "consider". 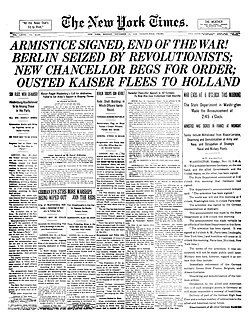 The New York Times uses an unusually large headline to announce the Armistice with Germany at the end of World War I. Publisher: It's finding the center of your story, the beating heart of it, that's what makes a reporter. You have to start by making up some headlines. You know: short, punchy, dramatic headlines. Now, have a look, [pointing at dark clouds gathering in the sky over the ocean] what do you see? Tell me the headline. Protagonist: HORIZON FILLS WITH DARK CLOUDS? Publisher: IMMINENT STORM THREATENS VILLAGE. Protagonist: But what if no storm comes? Publisher: VILLAGE SPARED FROM DEADLY STORM. A number of newspapers use humour, puns, alliteration or other word play devices in their headlines. Equally, the need to keep headlines brief occasionally leads to unintentional double meanings, if not double entendres. For example, if the story is about the president of Iraq trying to acquire weapons, the headline might be IRAQI HEAD SEEKS ARMS, or if some agricultural legislation is defeated in the United States House of Representatives, the title could read FARMER BILL DIES IN HOUSE. MUSH FROM THE WIMP – Boston Globe in-house joke headline for an editorial, not changed before 161,000 copies printed. Theo Lippman Jr. of the Baltimore Sun declared "Mush from the Wimp" the second most famous newspaper headline of the 20th century, behind "Wall St. Lays an Egg" and ahead of "Ford to City: Drop Dead". FREDDIE STARR ATE MY HAMSTER – The UK Sun (1986), claiming that the comedian had eaten a fan's pet hamster in a sandwich. The story was later proven false, but is seen as one of the classic tabloid newspaper headlines. WE ARE POPE (in German: Wir sind Papst); Bild after a German was voted to become pope Benedikt XVI in 2005. Editor of The New Republic, Michael Kinsley, began a contest to find the most boring newspaper headline. According to him, no entry surpassed the one that had inspired him to create the contest: "WORTHWHILE CANADIAN INITIATIVE", over a column by The New York Times' Flora Lewis. Newspaper headlines are notably the most effective and reliable conduits of propaganda materials. The most common type of propaganda headlines are false equivalency, red herring, and whataboutism. These headlines often will appear to make incomparable objects equal, conduct irrelevant analogies and tangents away from a hidden kernel in the headline, or deflect blame from a third-party within the headline. These headlines, opinion-forming as any other media, serve as catalysts to cognitive dissonance, an oft-stated goal for dictatorships and totalitarian regimes. These ploys are not exclusive to unfree societies. Acclaimed news sources have been accused of utilizing similar tactics. ^ Wilford, John Noble (14 July 2009). "On Hand for Space History, as Superpowers Spar". The New York Times. Retrieved 24 April 2011. ^ Scharfenberg, Kirk (1982-11-06). "Now It Can Be Told . . . The Story Behind Campaign '82's Favorite Insult". Boston Globe. Boston, Massachusetts. p. 1. Retrieved 2011-01-20. Abstract only; no article without payment. ^ Fox, Margalit (2016-06-09). "Vincent Musetto, 74, Dies; Wrote 'Headless' Headline of Ageless Fame". The New York Times. ^ "Telegraph wins newspaper vote". BBC News. 25 May 2006. ^ "Super Caley dream realistic?". BBC. 22 March 2003. ^ Kinsley, Michael (1986-06-02). "Don't Stop The Press". The New Republic. Retrieved April 26, 2011. ^ Lewis, Flora (4 October 1986). "Worthwhile Canadian Initiative". New York Times. Retrieved 9 March 2013. ^ Kinsley, Michael (28 July 2010). "Boring Article Contest". The Atlantic. Retrieved 26 April 2011. Look up headline in Wiktionary, the free dictionary.